Excellent Pizza at Treeland’s Resort on the Chippewa Flowage! I’ve driven right past Treeland’s Resort many times without stopping in, and I sure regret it now! I could of been enjoying their pizza a long time ago! A few weeks ago we were making a bit of a road trip around the Chippewa Flowage and decided to pop in to this resort for some food. I had heard about this landmark resort off of Hwy B, but had never stopped here before. The restaurant and bar areas were very clean, tastefully decorated in the up-north theme, and the seating and lake views are very relaxing. We sat at the bar for an after-work cocktail while we looked through their menu. We decided to try their pizza and chose the ‘super 7’ which has most of everything you might think of putting on a pizza. The male bartender (sorry, can’t remember his name) offered excellent conversation while we waited for our food, along with Ms. Treland, who helped with the bar while working on guest registrations, etc. We didn’t have to wait long for our pizza. 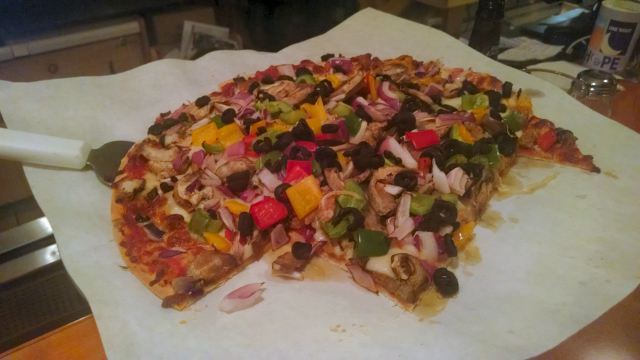 When it came out, I was even impressed by how it looked- perfectly baked thin crust absolutely LOADED with fresh toppings – it was irresistible to even look at! Now, I am not very good at writing about how food tastes, so I’ll make this short and simple; this was the BEST pizza I’ve had up in the Hayward area! The crust was cooked to perfection, just crisp enough to hold the massive amounts of cheese and toppings on each piece, but not chewy or hard to bite off. The toppings were excellent and very fresh – they paid particular attention to how each topping was cut up and distributed on the pizza, so I got the full flavor of all ingredients in each bite. The sauce had the perfect blend of spices but was not overwhelming at all, and the cheese was in just the right proportion to the toppings. We’ve been back since that first visit and they have consistently reproduced this excellent pizza! We will be venturing their way for Friday night fish fry and are expecting an awesome meal! The great service, great food and friendly atmosphere are top-notch. If you haven’t been to Treeland’s Resort, you must try it soon – they do close for the winter season beginning mid-October. If you can’t get here this year – be sure to put it on your agenda for next season! This entry was posted in Dining & Resorts Hayward Area, NORTHWOODS LIFE and tagged Best Pizza in Hayward WI area, Good place to eat on Chippewa flowage, Treeland Resort hHayward WI. Bookmark the permalink.